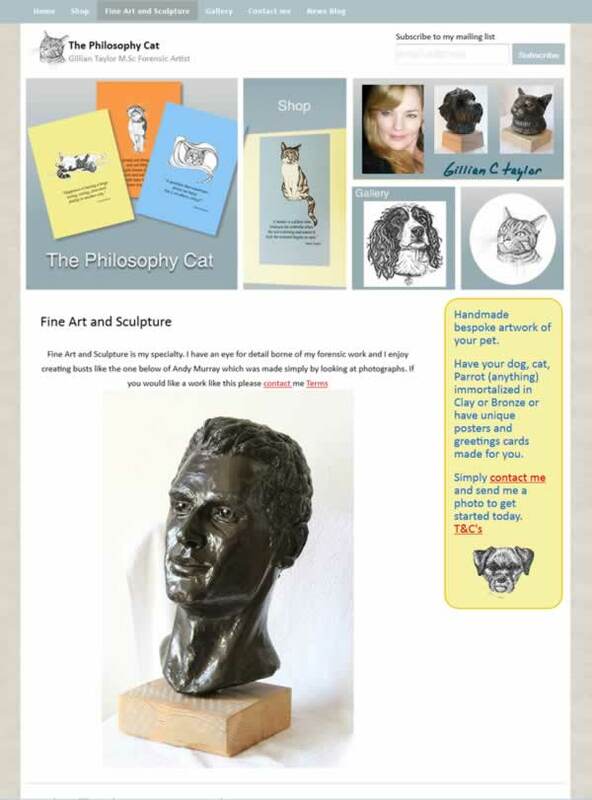 This was an interesting project, we have just launched The Philosophy Cat website for a local artist whose eye for detail is amazing. Gillian Taylor from Haddington East Lothian is a fully trained and qualified M.Sc. Forensic Artist and Craniofacial Reconstruction Practitioner (CRP) as well as portrait artist and sculptor. Gillian makes a range of greetings cards plus Original designs and handmade prints with her own artwork creations and witty or thoughtful quotes on them. The unique thing is Gillian can create a likeness of your own pet and turn them into cards or prints or even a bronze statue if you so desire. Our brief on this build was to provide simplicity and clean design with functionality discreetly built in to make an interesting shopping experience for the user. Communication between website visitor and Gillian is by phone or contact form with the ability to upload images of your own pet for Gillian to render in pen and ink or pencil drawing before creating your finished product. Unusually for us we did not have a lot of image work to do because as you can imagine someone with Gillian’s skills was able to provide much of the beautiful artwork you see on the site, we enjoy working with and look forward to help develop The Philosophy Cat further. Who knows maybe Mr Andy Murray will see the remarkable bust that has been made of him and buy it perhaps!